After almost 50 years of skiing and jumping at the Howelsen Hill, visionary local ranchers founded Storm Mountain (now the Steamboat Ski Area) where the legendary �champagne powderTM� has long attracted visitors from around the world. The development and success of the ski industry in Steamboat Springs relies on the dedication and professionalism of our local and national ski patrol. In 1941, three years after the National Ski Patrol was founded, Steamboat Springs began its own ski patrol. 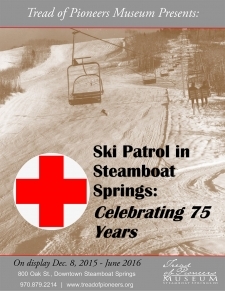 To celebrate the 75th anniversary of the ski patrol in Steamboat Springs, the Tread of Pioneers Museum created a dedicated display in our �Ski Town USA�� exhibit. The display chronicles the history of the local patrol, one of the oldest in the West, with a compelling presentation of ski patrol artifacts, photographs and first-hand stories (on display through May 2016). The ski patrol display features a wire rescue toboggan that was purchased from U.S. Army surplus and used on historic Howelsen Hill from 1947-56, as well as first aid belts (complete with medical supplies) from long-time patrolmen, Vernon Summer and John Fetcher. Fetcher was one of the founders of the Steamboat Ski Area, an inductee of the Colorado Ski and Snowboard Hall of Fame, and one of the oldest patrollers in the country who served until he was 93 years old. The Steamboat Ski Area ski patrol base was named for Fetcher who passed away in 2009. Other displayed objects include a 1965 �daily duty log roster,� uniforms and patches from various local patrollers, and a 1966-67 Ski Area trail map that shows all 182 mapped injuries including just 17 toboggan rescues for the entire season. Today, Steamboat�s patrol could conduct that many toboggan evacuations in one day. The museum hosted over 100 past and present ski patrol members and their families for the exhibit�s opening reception on January 21, 2016. Some patrollers travelled from as far as Washington and other distant states to attend the event. Many memories were captured on video for the museum�s oral history archive and many more were shared among friends while enjoying the exhibit and a few laughs. A trip to Steamboat Springs is made most memorable by travelling back in time at the Tread of Pioneers Museum. Explore our skiing heritage and the ski patrol history dedicated to keeping winter sports safe and fun. 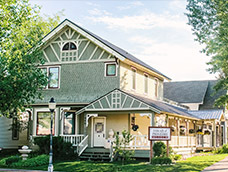 The museum is located on the corner of 8th and Oak St. in downtown Steamboat Springs. Mention this article for free admission for all patrol members. www.treadofpioneers.org.